FastTIMES, the newsmagazine for the near-surface geophysical sciences, grew out of a quarterly printed newsletter published by the newly formed Environmental and Engineering Geophysical Society (EEGS). The first issue of "The EEGS Newsletter," co-edited by Philip Carpenter and Thom Fisher, was published in December 1992 (Figure 1). The newsletter superseded the previous Society of Engineering and Mineral Exploration Geophysicists newsletter with the formation of EEGS. 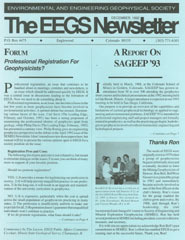 The EEGS Newsletter was published from December 1992 through May 1998. Following Phil Carpenter as editor were Steve Daut and Michael Powers (Table 1). 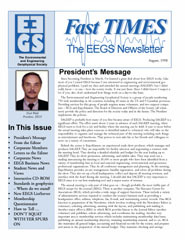 In August 1998, under editor Michael Powers, the EEGS Newsletter became "FastTIMES: The EEGS Newsletter." According to Mike, the change was "a response to changes within our organization and within our world." The August issue was also the first issue "printed entirely from digital sources" and is the first issue that is available online. The cover and appearance contained upgraded graphics and the new title (Figure 2). Subsequent editors (Table 2) included Ron Kaufmann (1999-2001) and Rick Taylor (2001-2002). 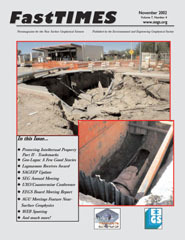 With the November 2000 issue, Ron Kaufmann moved the President's Message from the front cover and replaced it with compelling graphics: a sinkhole swallowing a home (Figure 3). Figuratively speaking, it might have represented then-President John Nicholl's home, sucked off the front cover and relegated to obscurity on page 4. Norm Carlson, who published his first issue as FastTIMES editor in August 2002, was also the first to assign volume and issue numbers to the cover. For reasons lost to the ravages of time, he christened the November 2002 issue as volume 7 number 4 (Figure 4). Counting backward, we would then calculate that the first issue of FastTIMES would have been volume 3, issue 1. Norm is still trying to figure out how that happened. With this issue, for which Ron Bell served as "Special Associate Editor," FastTIMES evolved from "The EEGS Newsletter" to a "Newsmagazine for the Near Surface Geophysical Sciences." Ronald Bell served as editor for four issues published in 2004 and 2005. He took FastTIMES farther upscale, producing content-rich issues highlighting unexploded ordnance (UXO) detection, SAGEEP, environmental and engineering geophysics worldwide (Figure 5), and university research and education. 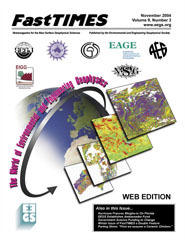 Electronic editions of the printed magazine were posted to the web for download. Ron passed the editor's baton to Brad Isbell, who published the last two printed issues of FastTIMES in 2005. These issues highlighted UXO and SAGEEP 2005. Following the final FastTIMES issue for 2005, the EEGS Board of Directors took FastTIMES in a new direction. 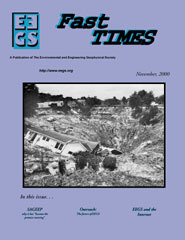 Beginning with the December 2006 issue, the editorial team of Jeffrey Paine, Roger Young, and Brad Isbell began publishing FastTIMES in an electronic-only format that is distributed to EEGS members, offered to other geophysical and earth-science societies for voluntary redistribution, and currently is freely available for download from the EEGS web site. 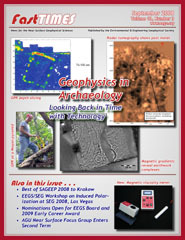 Content has broadened to include topics such as cold-weather geophysics, shallow-water geophysics, and geophysics in agriculture and archaeology (Figure 6). The editors strive to ensure FastTIMES remains a newsmagazine for all things near-surface. Article by Jeffrey G. Paine, October 16, 2008.